#GrowthHacking: Fad or for real? There’s a new kid in the startup community sandbox known as a “growth hacker.” According to Andrew Chen, a growth hacker is a hybrid of a marketer and a developer, someone who looks at the traditional question “How do I get customers for my product?” and answers it with A/B testing, landing pages, viral factor, email deliverability and more. There are a couple of key differences between a traditional digital marketer in a tech startup and a growth hacker. Mainly, before a startup has product/market fit (that is, when people know they want your product and are happy with your offering), virality must be built into the core of your product. Why? With the advent of superplatforms, startups can now access over 100 million consumer markets. Discovery-stage startups now have the opportunity to quickly access their identified beachhead customer segment and to go from zero users to tens of millions of users in just a few years. It would be remiss not to build virality into the core code. MaRS clients MyShoebox, Bitstrips and, more recently, Woof are great examples of startups that were able to build virality into the core code of their products and drive very high traction early on without having extensive marketing budgets or marketing staff. Once product/market fit is achieved, growth hackers can help “spin up the flywheel” on what is already working well with the product. 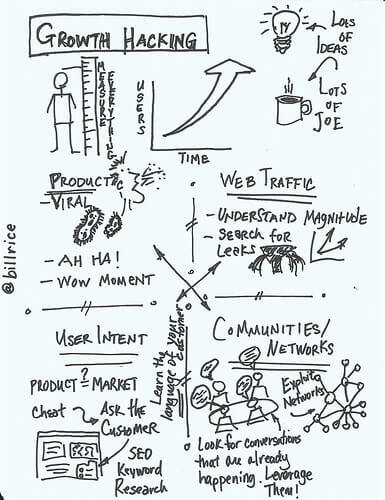 This doesn’t mean that the continuous testing and planning of “get, keep, grow” tactics (listening to customers) are not important; but it does mean that a lot more emphasis must be placed on building virality into the product’s core code early in the startup lifecycle to acquire users, while continuously evolving to support retention and loyalty of users. See “Startup marketing: Get, keep and grow” for more information on digital tactics and metrics that matter. 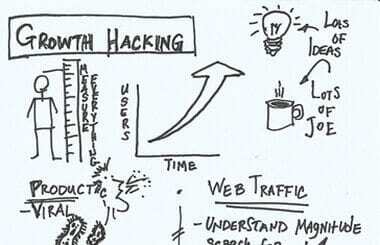 What are the implications of growth hacking for startups? Research by Nielsen solidifies this idea. According to a 2012 study: 92% of people globally trust word-of-mouth recommendations from friends and family members. The easier that a startup makes it to share its product (delivering more value than they get) the more the growth hacker has to continuously test tactics in the product and marketing funnel. We recommend setting up a weekly growth-hacking meeting where you identify to-be-tested, in-testing and pass/fail tactics as a team and then constantly driving tactics into the funnel each week, which drive growth aligned to cost-per-user acquisition and lifetime value metrics. Therefore, growth hacking fundamentally reduces the costs of being wrong and allows startups the freedom to experiment and try new things. Rather than waiting for it to happen magically, marketers need to contribute to this process. Isolating who your customers are, figuring out their needs and designing a product that will blow their minds—these are marketing decisions, not just development and design choices. So, is growth hacking a fad or for real? I believe the evidence is clear that it is for real. Growth hacking may be interpreted or named differently depending on who you talk to, but I feel that it’s here to stay. Below you’ll find a list of resources, including whole communities (like Quora), that are evolving around the topic to help guide you on your growth-hacking adventures.